Much of their work is exploratory, using sounds as a starting point for compositions. "Looking for new brushstrokes," is how Ryan describes the process. Despite its rewards, it is an approach which involves intense hard work and frustration. "So many times in the studio we wanted to call it quits," Enya admits, "but now we know it was worth carrying on. By ignoring fashion and following her Celtic inclinations, Enya wafted to the top of the charts with Orinoco Flow. She talks to David Toop about success. Yoga, Enya states, quietly but emphatically, is the answer. She is recalling the occasions, such as record signing, when her fans have had the opportunity to reveal just what it is that makes Enya's music so appealing. Some of them, apparently, use it as an aid to yoga. "Some of them say it has helped them through illnesses, helped kids through exams, helped them through emotional times or helped them to relax," she adds. "It's very moving music for a lot of people, and very hard to conjure up a name to describe it. We're looking for an Enya sound. We want it to be recognizable. We want the melodies to be so strong that they stay around. We don't want just overnight success." Dressed in a grey, striped jacket and black skirt, and referring to "Enya and her music" as if they were distant relatives, Enya could easily be mistaken for a replica of herself, a somewhat more conventional version of the aerial presence who sings in her promotional video for Orinoco Flow", her recent hit single. This is the real Enya, however, the latest beneficiary of popular music's occasional tendency to catapult a virtual unknown into nascent stardom. Back in April, Enya and her support team of producer Nicky Ryan and lyricist Roma Ryan had finally completed Watermark, an unusual album of cinematic moods, stately melodies and vocal layers of ecclesiastical purity and density. If not entirely confident of a glowing future for her record, Enya at least possessed an unshakeable conviction. If nobody bought it, then she would carry on regardless. There would be no indecorous rush to record disco remixes. The future was brighter than even the most reckless of pop soothsayers could have predicted; thanks to Watermark being given an uncharacteristically sympathetic hearing by Radio I, Orinoco Flow emerged as a particularly well received track. On its release as a single it climbed the pop charts in a few short bounds and sat at the top for three weeks. Was Enya surprised? "Weren't you?" she asks, slightly incredulous. Like Tracy Chapman and Tanita Tikaram before her, Enya had proved that 1988, if nothing else, was the year in which women singers reaped handsome rewards by ignoring the imperatives of fashion and simply following their own inclinations. Enya, whose full name is Eithne ni Bhraonain, was born in Gweedore, County Donegal. "They call it the wild county," She says. "It's in the north-west of Ireland, at the very top, and it's very beautiful. You don't appreciate it until you're away from home and you're in the city all the time." Though Enya is reluctant to admit any influence of this landscape on her composing, there is no stopping the way in which Watermark suggests romantic, mythic images of clifftops and seascapes. One elegiac song, "On Your Shore", is a specific reference to childhood. "It's about a beach at home and it's really close to me. Beside it there's the graveyard where my grandparents are. "When the first people lived in Gweedore, there was a sort of shelter for the fishermen," she says. "The church was down there but here was a tragedy. The sea came in when there was a sermon going on and everybody was wiped out. There are a lot of stories like that, where we would start to talk about them and a song would evolve." Perhaps this element of Celtic saga and legend, the perennial charm of the fireside fable, has been a cornerstone of the platinum sales notched up by Enya in a few short months. Matched by music with echoes of the monastery, epic travels, green Irish hills and a Carl Orff-style paganism, it is a heady cocktail. A dash of Andy William's classic pop hit of 1963, Can't Get Used To Losing You, has also been noted on more than one occasion, thanks to the pizzicato string effects of the opening bars of Orinoco Flow. Enya is canny about the similarity between the arrangement of her song and the Williams record. It is possible that her father played Can't Get Used To Losing You in his dance band, the Slieve Foy, a group which toured Irish ballrooms playing the hits of the Fifties and Sixties. Her mother also sang and would enter the family in music competitions called Feis Ceoil. With such an early introduction to public performance of Irish traditional songs and ballads, it is not surprising that a family group ensued. This was Clannad. While Clannad toured, Enya attended school. "I studied classical music when I was at college," she says. "Piano was my instrument. I actually thought I'd go more into the academic side of music - teaching. I wasn't interested in the stage aspect. Then I just found myself saying I'd just see what it's like, you know, and I haven't left it since." In 1980, she joined her elder brothers and sisters in Clannad singing and adding electronic keyboards to their previously all-acoustic sound. After two years she left to pursue her own direction and was taken, under the wing of Nicky and Roma Ryan. "Nicky and Roma set me up in their house in Dublin. At that stage, their studio was just a big room. It used to be a Scouts' hall or something. The piano was there and they just said: 'Why don't you concentrate on sorting out the area of music you want to get involved in?' From playing the piano and recording and listening to classical music, I ended up just improvising and writing my own stuff." Her demo tape was sent to David Puttnam, who was so taken by the melodic strength of the material that he commissioned Enya to score the soundtrack for a film he produced in 1985, The Frog Prince. Following this first step, they submitted music for The Celts, a BBC television series which had been in production for two years at that point. "The director wanted a modern Celtic sound." Enya says. The job was hers. Since, unwittingly, he had given an apt enough description of Enya's music. The Celts, however, was the first occasion for experimentation with choral parts constructed from multiple layers of overdubbed solo voice. This technique was developed further on Watermark. It is a demanding exercise, since as the vocals are laid over each other to achieve a satisfactory textural depth - perhaps up to 120 times - the tuning of each new recorded part is critical in the extreme. Enya loves the challenge, even claiming, with some perversity, to welcome her own mistakes as a chance to try again to get closer to perfection. While Enya is the perfectionist, her producer, the tall and wild-haired Nicky Ryan, is more inclined to go for the vocal take which has the most feeling. "I think the most important aspect of my role," he says, " is the atmosphere or sound of what she's doing. I'm more bluesy in my attitude - if it sounds right, leave it alone - but Enya always feels like it could be done a little bit better, which is true." Much of their work is exploratory, using sounds as a starting point for compositions. "Looking for new brushstrokes," is how Ryan describes the process. Despite its rewards, it is an approach which involves intense hard work and frustration. "So many times in the studio we wanted to call it quits," Enya admits, "but now we know it was worth carrying on." Note: Originally transcribed by Tom�s Rom�n. 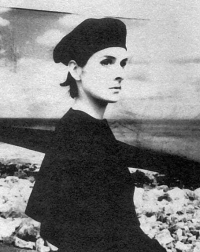 Photo caption: Enya, formerly a member of Clannad: "I ended up just improvising and writing my own stuff".